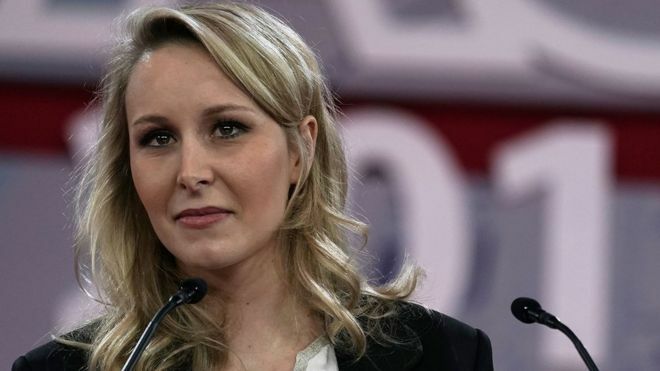 The champion of Donald Trumps America First agenda, who was invited to speak at the National Front party congress in northern France by Marine Le Pen, spoke only about her 28-year old niece at their joint press conference. She is not simply a rising star on the right in France. Shes one of the most impressive people in the entire world, Bannon, an American nationalist who ran the right-wing Breitbart News, told reporters, without mentioning his host Marine Le Pen. Marion Marechal-Le Pen, a former lawmaker, is more socially conservative and economically liberal than her aunt. She was not present at the congress in Lille on Saturday, having said she is now working on an education project. Addressing the FN congress earlier, Bannon was given a standing ovation, as he told party members history was on their side and would eventually lead them to victory. What Ive learned is that youre part of a worldwide movement thats bigger than France, bigger than Italy, bigger than Hungary, bigger than all of us, he said. Article from a year ago. Marion Marechal has continued to be in the public eye, and with some guidance from Bannon has established a school in Lyon for the training up of conservative leaders in everything from French culture/religion to economics. Who pays you to post this stale crap on Freerepublic?